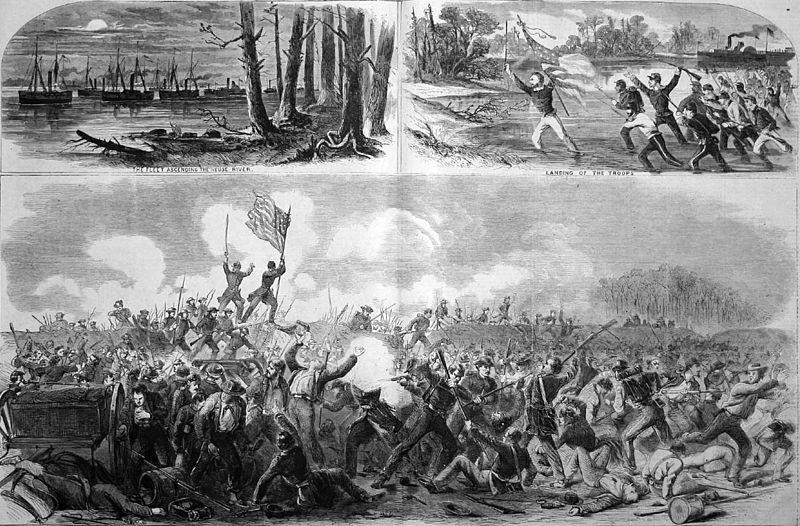 The latest war news, this week about the Battle of New Bern, which had been fought on March 14, 1862. This is from The Prescott Journal of March 26, 1862. F U L L P A R T I C U L A R S ! Commodore Rowan1 was in command of the fleet of gunboats, and had sunken vessels, torpedoes, and other rebel obstructions to overcome and pass, but surmounted all with but slight damage to only two of his fifteen vessels. Two brigs, three barks, and ten schooners were sunk by the rebels, above two rebel batteries. The latter were silenced, the sunken vessels passed, and our flag hoisted over the silenced batteries as our force went along. This was on Saturday P. M., and night closed in. Sunday morning a heavy fog set in, but lifted, when our gunboats passed up safely and silenced Fort Thompson with its two heavy Columbiads. Then Fort Ellis with nine guns was captured after pretty brisk fighting, but the rebels fled soon in a panic, and our flag waved over another fort. Only one fort was left to be engaged and Newbern [sic] would be at the mercy of our troops ; this was Fort Lane—the rebels having enough of the boats, offered little if any resistance and fled. The rebels then fired a large number of scows filled with rosin and turpentine, inteding to float them down and burn our gunboats, but they got stuck and burnt away furiously. The gunboats then shelled the depot and track, but our troops had then crossed and a white flag was hoisted. Our navy did not lose a man. Operations on land were briefly as follows : Our troops landed twelve miles below Newberne [sic], Gen. Reno’s brigade3 in the advance. Most of the troops were so anxious to land that nearly every regiment jumped into the water and waded ashore. In less than two hours, after marching two miles, they found deserted rebel camps, with fires burning, and hot rebel breakfast untasted. A breastwork was only passed and the division bivouacked for the night, and early in the morning skirmishing began. Foster’s brigade,4 comprising the Massachusetts 24th, 25th, 26th, 23d, with the 10th Connecticut in reserve, were in line, and engaged a twenty gun battery of the rebels on their left flank, who showered grape, canister and shell upon them, also heavy musketry from their infantry. 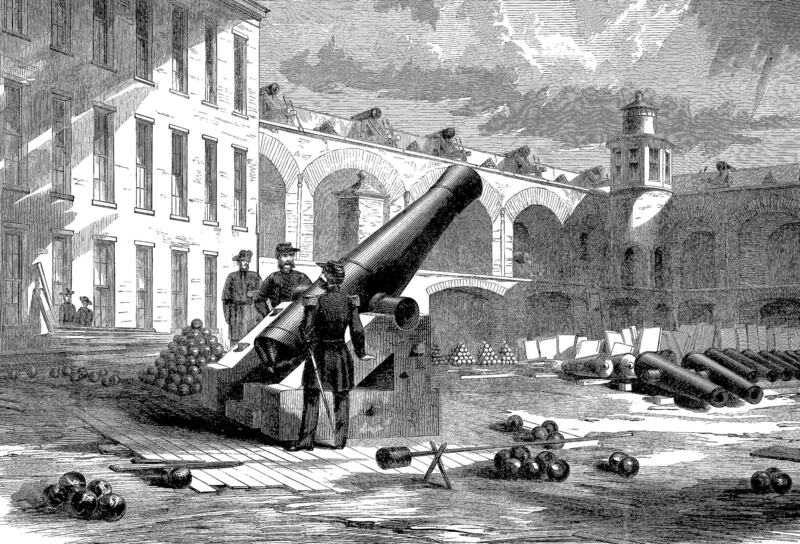 The 10th Connecticut were ordered to support the 27th Massachusetts, which had suffered severely. The 3d brigade together with the 2d executed a flank movement, and the order to charge bayonets was given. A hand to hand fight ensued of the most desperate character, when our troops drove the rebels out at the point of the bayonet, chasing them out of sight. The rebels took possession of a railroad train and fled from Newbern [sic], burning some bridges, the Washington House, some private dwellings, and a number of whiskey and turpentine distilleries. Slaves had commenced pillaging but were stopped. A number of Unionists were found in the city. 1. Harper’s Pictorial History of the Civil War, by Alfred H. Guernsey and Henry M. Alden, Chicago: McDonnell, 1866-68 (available in the UWRF Archives E 468.7 .G87 1866). 2. Stephen Clegg Rowan (1808-1890) was a career navy man. At the start of the Civil War, he was captain of the Pawnee, and made gallant attempts to relieve Fort Sumter. He assisted in the Battle of Hatteras Inlet, the Battle of Roanoke Island, and provided support at the Battle of Elizabeth City and Edenton. 3. Brigadier General Jesse Lee Reno (1823-1862), a career military officer, led the 2nd Brigade. He will be killed on September 14, 1862, at the Battle of South Mountain. The city of Reno, Nevada, is named for him. 4. Brigadier General John Gray Foster (1823-1874), another career military officer, led the 1st Brigade. From 1862-1863 he will command the Department of North Carolina. 5. Brigadier General John Grubb Parke (1827-1900), an Army engineer, led the 3rd Brigade. William Smith Clark (1826-1886) was the lieutenant colonel of the 21st Massachusetts Infantry. 6. Robert H. Stevenson; William L. Horton; Henry Merritt.